Tom Story as Tom, Madeleine Potter as Amanda and Jenna Sokolowski as Laura in the Fordâ€™s Theatre production of â€œThe Glass Menagerie,â€ directed by Mark Ramont. Photo by Scott Suchman. Welcome to St. Louis: a place where sons seem to inherit the wandering ways of their fathers, daughters fear the world beyond the safety net of home, and mothers measure their worth in numbers of gentlemen callers. 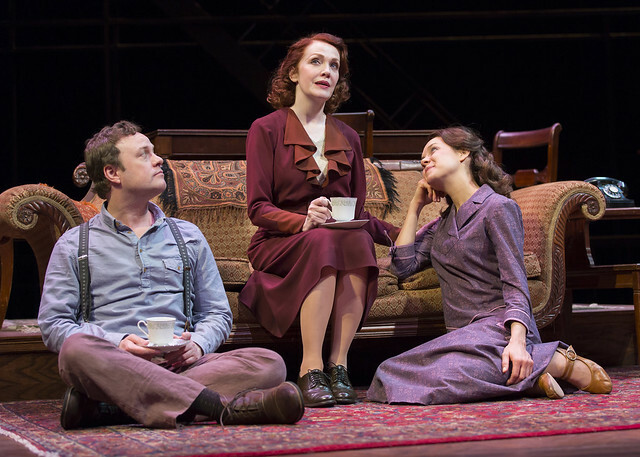 The Gateway City serves as the backdrop for renowned playwright Tennessee Williams‘Â stunning play,Â The Glass Menagerie â€“ a striking drama about the fragility of familyÂ and the unbearable weight the obligation of familial bonds can impose. Menagerie shot Williams into the ranks of celebrated playwrights when it premieredÂ in Chicago in 1944, and under the direction of Mark Ramont, the productionÂ currently on stage at Fordâ€™s Theatre – the debut of Williams’ work at the historic theater – leaves no room to question why. Largely biographical, the glimpse of life within the walls of the Wingfield family’s shabby apartment serves as a window into Williamsâ€™ own struggles â€“ an overbearing mother, an unwell sister, an absent father, and a tangible desire to escape his situation. The play opens with Tom Wingfield (Tom Story) addressing us directly – as the narrator, this is his story to tell, and it’s his eyes that we’ll see the Wingfield’s world through. The restless son of a telephone salesman who left his familyÂ behind 16 years ago in pursuit of all things long distance, Tom dreams about life far from the jobÂ he hates in a city that suffocates him. Much to his mother’s disapproval,Â Tom disappearsÂ to the movies every night to bask in the glow of all the beautiful people on screen having the adventures that he’ll never get to go on. His older sister, Laura (Jenna Sokolowski), on the other hand, is happier at home – a slight limp and a cripplingly shy demeanor have led her to cut herself off from the rest of the world, existing only within her own family. Their mother, Amanda (Madeleine Potter), clings to her glory days as a highly-courted debutante -Â Â although it’s clear that the years since her husband walked out have left her with nothing but the ghosts of suitors past. In other words, the Wingfields are the stuff of psychologists’ dreams. 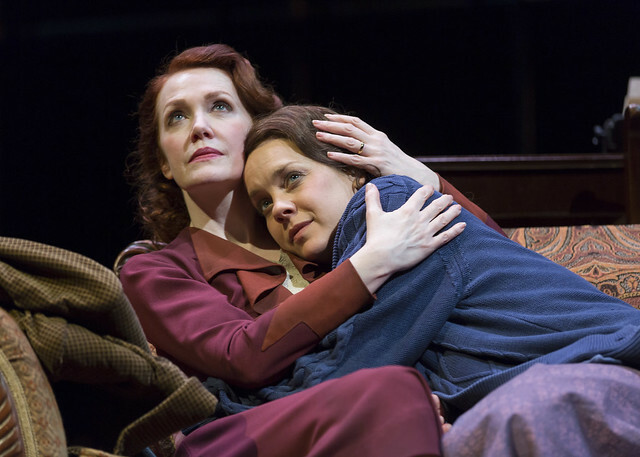 Madeleine Potter (left) as Amanda and Jenna Sokolowski as Laura in the Fordâ€™s Theatre production of â€œThe Glass Menagerie,â€ directed by Mark Ramont. Photo by Scott Suchman. Although she has the best of intentions, Amanda loves her childrenÂ a little too loudly, and both Tom and Laura struggle toÂ live up to herÂ expectations for them. Her fears for her own future as a single, aging woman are projected onto Laura, and she coerces Tom to bring home a friend from work in an effort to find her daughter a husband. When Tom begrudgingly agrees and sets a date, the whole house is sent into a tail spin of preparations for a potential match. Jim (Thomas Keegan)Â has ambitions beyond the shoe warehouse where he and Tom are employed, butÂ for the fuss Amanda makes over him at dinner (much to Laura’s embarrassment), one would think he was royalty instead of a shipping clerk.The connection between Jim and Laura is palpable, but there’s a tiny piece of information that, once discovered, takes the evening on a dramatic turn that none of them could have predicted. 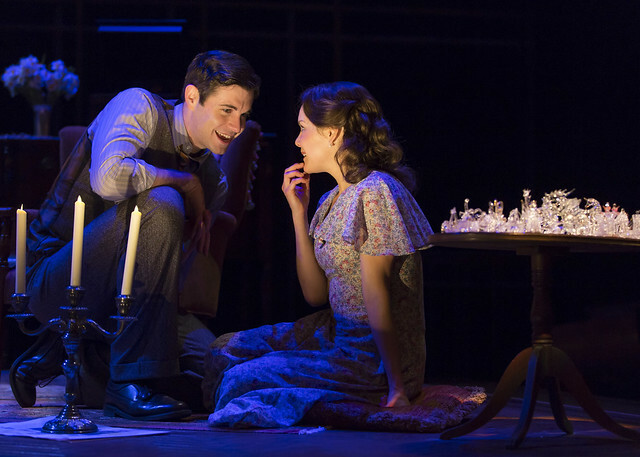 Thomas Keegan as the Gentleman Caller and Jenna Sokolowski as Laura in the Fordâ€™s Theatre production of â€œThe Glass Menagerie,â€ directed by Mark Ramont. Photo by Scott Suchman. What makes this play work so well is how easy it is to relate to elements of all four characters, from Tom’s rejection of his family’s dependence on him to Laura’s overwhelming insecurities and Jim’s optimistic insistence that he’ll beat the odds stacked against him. Amanda is as complex and she is transparent, and Williams – pulling inspiration from his own mother – gives us a woman that we both admire and resent (which Potter delivers with the grace, grit, and guilt trips befitting of a Southern belle). Being presented at a theater likeÂ Ford’s only adds another layer of depth and sobriety to an already intense production – Williams’ lushly written script echos beyond the hallowed stage, and the space lends itself perfectly to the vulnerable and openly human themes throughoutÂ the play. Ultimately, the Wingfields and their gentleman caller would appear to be as delicate as the glass animals that Laura collects – one miscalculated move could send the whole thing crashing to the ground. Williams’ finely crafted balancing act is breathtaking, bittersweet, and onlyÂ at Ford’s Theatre through February 21st. Tickets start at $17 and are available here. Ford’s is located at 511 10th St., NW, and performances are Tuesdays through Saturdays at 7:30 PM and Saturdays and Sundays at 2 PM. There’s also an 11 AM matinee on February 18th for anyone willing to play hooky from work to spend the morning at the theater (which I highly recommend).